2009 September « English Words of (Unexpected) Greek Origin. The word election (e-lec-tion) is directly derived from the Latin verb eligere (to choose, select, etc) from the root word lego (to gather, to collect, to choose, to pick out etc), which is a transliteration of the Greek verb lego (to collect, to choose, to say etc) and the prefix ex- from the Greek prefix ek- (out of, from). Η λέξη election (εκλογή) προέρχεται από το λατινικό eligere (επιλέγω, συλλέγω) που προέρχεται από το ελληνικό εκλέγω. 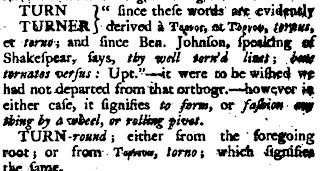 The verb turn (to rotate, revolve), comes from the latin tornare (turn on a lathe) from tornus (lathe), which is a transliteration of the Greek tornos (lathe; τόρνος). In modern Greek (Romeika, the language of Romei-Romans). Το ρήμα turn (στρέφω, γυρίζω) προέρχεται από το λατινικό ρήμα tornare από το tornus (τόρνος), το οποίο αποτελεί μεταγραφή του ελληνικού τόρνος. Από την ίδια ρίζα προέρχονται και τα: tourism (τουρισμός), tour (περιοδία), attorney (δικηγόρος, πληρεξούσιος), tornado (τυφώνας), torch (δάδα). Tags within the post: etymology of turn, etymology of turner, etymology of torment, etymology of torch, etymology of tourism, etymology of tourist, etymology of tour, etymology of tourer, etymology of attorney, etymology of tornado, etymologie de tour, etymologie de tourisme, etymologie de touriste, etymologie de touret, etymologie de alentour, etymologie de tourillon, etymologie de tourner, etymologie de tournant, etymologie de tourne, etymologie de tournee, tornade, etymologie de tournailler, etymologie de tournoi, etymologie de contour, etymologia de turno, etymologia de contorni, etymologia de turismo, etymologia de turista, etymologia de tornare, etymologia de torno, etymologia de tornitura, etymologia de torneo, etymologia de contorno, etymologia de turno, etymologia de torna, etymologia de contorno, etymologia de turismo, etymologia de turista, etymologia de torno, etymologia de tornilla, etymologia de tornear, etymologia de tornar, etymologia de tornada, etymologia de torneador, etymologia de tornado, etymologia de tornillo, etymologia de torneo, etymologia de contorno, Etymologie der Tour, Etymologie der Tourism, Etymologie der Tourist, Etymologie der turnen, Etymologie der Turnen, Etymologie der Turnplatz, Etymologie der Turnier, Etymologie der Kontur, learn Greek online, learn easily Greek using cognates, etymology of English words, Etymology of Latin words, origin of Latin words, ortigin of English words, ετυμολογία του τόρνος, ετυμολογία του τορνευτής, ετυμολογία του τουρισμός, ετυμολογία του τουρίστας, ετυμολογία του τουρ, ετυμολογία του τουρνουά, προέλευση του τόρνος, προέλευση του τορνευτής, προέλευση του τουρισμός, προέλευση του τουρίστας, προέλευση του τουρ, προέλευση του τουρνουά, origin of turn, origin of turner, origin of torment, origin of torch, origin of tourism, origin of tourist, origin of tour, origin of tourer, origin of attorney, origin of tornado, origine de tour, origine de tourisme, origine de touriste, origine de touret, origine de alentour, origine de tourillon, origine de tourner, origine de tournant, origine de tourne, origine de tournee, origine de tornade, origine de tournailler, origine de tournoi, origine de contour, origine de turno, origine de contorni, origine de turismo, origine de turista, origine de tornare, origine de torno, origine de tornitura, origine de torneo, origine de contorno, origine de turno, origine de torna, origine de contorno, origine de turismo, origen de turista, origen de torno, origen de tornilla, origen de tornear, origen de tornar, origen de tornada, origen de torneador, origen de tornado, origen de tornillo, origen de torneo, origen de contorno, origin Tour, origin Tourism, origin Tourist, origin turnen, origin Turnen, origin Turnplatz, origin Turnier, origin Kontur. Η λέξη tomb (τάφος, μνήμα) προέρχεται από το λατινικό tomba (τάφος, τύμβος), το οποίο αποτελεί μεταγραφή του ελληνικού τύμβος. The word gusto (enthousiastic enjoyment, pleasure, high spirits, cheerfulness) comes from the latin gustus (taste) from the verb gusto (to taste), which derives from the Greek verb geuso (to taste; γεύσω). Η λέξη gusto (απόλαυση, τέρψη, ευχαρίστηση, κέφι) προέρχεται από το λατινικό gustus (γεύση) από το ρήμα gusto (γεύσω), που με τη σειρά του προέρχεται από το ελληνικό ρήμα γεύσω/ γεύσομαι. The male proper name Andrew derives from the Greek name Andreas (Ανδρέας), which comes from the noun aner (“man”; gen. andros: “of a man”; ανήρ). Andria, Andriana, Andries, Andrija, Andrina, Andris, Andrius, Andriy, Andro, Andraz, Andre, Andrea, Andreas, Andree, Andreea, Andrei, Andreia, Andreina, Andrej, Andreja, Andrejs, Andres, Andreu, Andrey, Andy. In modern Greek (Romeika; the language of Romei-Romans). e) andrios: brave, gallant [ανδρείος]. Το όνομα Andrew προέρχεται από το Ελληνικό όνομα Ανδρέας. Tags within the post: etymology of Andrew, etymology of Andria, etymology of Andriana, etymology of Andries, etymology of Andrija, etymology of Andrina, etymology of Andris, etymology of Andrius, etymology of Andriy, etymology of Andro, etymology of Andraz, etymology of Andre, etymology of Andrea, etymology of Andreas, etymology of Andree, etymology of Andreea, etymology of Andrei, etymology of Andreia, etymology of Andreina, etymology of Andrej, etymology of Andreja, etymology of Andrejs, etymology of Andres, etymology of Andreu, etymology of Andrey, etymology of Andriana, origin of Andrew, origin of Andria, origin of Andriana, origin of Andries, origin of Andrija, etymology of Andrina, origin of Andris, origin of Andrius, origin of Andriy, origin of Andro, origin of Andraz, origin of Andre, origin of Andrea, origin of Andreas, origin of Andree, origin of Andreea, origin of Andrei, origin of Andreia, origin of Andreina, origin of Andrej, origin of Andreja, origin of Andrejs, origin of Andres, origin of Andreu, origin of Andrey, origin of Andy. The Chalcidian/Cumae alphabet was the western variant of the Greek alphabet, used between the 8th to 5th centuries BC. 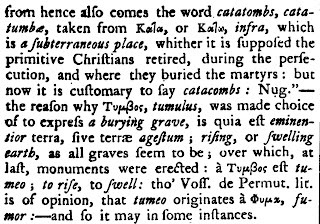 It was specifically used in the island of Euboea (including the towns of Kymi and Chalcis) and the areas west of Athens and in the Greek colonies of southern Italic peninsula. It was this variant that gave rise to the Latin alphabet. Το λατινικό αλφάβητο ουσιαστικά είναι το Ελληνικό αλφάβητο της πόλης της Χαλκίδος, το οποίο μεταφέρθηκε στη Ιταλική χερσόνησο, μέσω των αποικιών της πόλης. Toilet comes from the French toilette (a cloth, bag for clothes) from toile (cloth, net). Sense evolution is to “act or process of dressing” and then “a dressing room”. Toile (older: teile) comes from the latin te(xe)la [fabric, cloth, textile] from the latin verb texo, which derives from the Greek verb tefho (fut. tefxo; weave, create, build, construct; τεύχω). 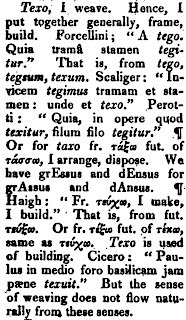 Note: Some etymologize toilet from the unification of the Greek article “to” (the) with the substantive eileon (involucrum, wrapper; είλεον) from the Greek verb eilyo (originally: Felnyo; ειλύω), which means to surround, to encircle, to girdle. From this verb (eilyo) comes also the latin verb volvo (trundle, wheel, roll). Η λέξη toilet προέρχεται από το γαλλικό toilette (ρούχο, ένδυμα) από το toile (ρούχο, δίκτυ), το οποίο με τη σειρά του προέρχεται από το λατινικό te(xe)la [ύφασμα, ένδυμα] από το ρήμα texo, το οποίο με τη σειρά του προέρχεται από το ελληνικό ρήμα τεύχω (ποιώ, κατασκευάζω, υφαίνω, διαμορφώ, σχηματίζω. Tags within the post: etymologie, etymology, etymology of English words, etymology of latin, etymology of toilet, etymology of towel, etymology of text, etymology of texture, etymology of toil, etymologie, origin of words, origin of English words, origin of latin, origin of toilet, etymology of towel, origin of text, origin of texture, origin of toil, teile, tela, texela, ειλύω, ετυμολογία, προέλευση των αγγλικών λέξεων, ετυμολογία των αγγλικών λέξεων, ρίζες των αγγλικών λέξεων, ετυμολογία των λατινικών, προέλευση των λατινικών λέξεων, learn Greek using cognates, learn greek online, learn Greek for free, learn modern Greek easily.